A celebration of Terry Gifford's classic climbs. The Joy of Climbing is the result of a search through Britain, Europe and America for the esoteric gems at the easier end of climbing. 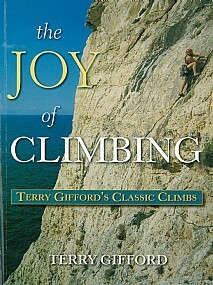 This special selection demonstrates the sheer fun and enjoyment of climbing. The articles have been especially chosen to provide a stimulating but achievable challenge, whether on a climb itself or appreciating the moves from the comfort of an armchair. In his writing, Terry Gifford adopts a variety of styles, resulting in a blend that enhances the dramatic nature of the subject and provides the reader with both the lyrical and the unexpected. As well as climbers, mountaineers and hill-walkers, this book will appeal to those who appreciate and have an interest in the environment and natural world.